We all love it, of course, when people — and their funerals — leave us with unambiguous memories. It’s rarely possible, however — not if we live long and close enough to others, and if people are real. My aunt was real and so I’m glad that in the spirit of who she was, we were honest about the complexity of her even as we celebrated her accomplishments and her much goodness. Aunt Gert was a woman of great intelligence. She was a voracious reader. She liked some people better than others, for no decent reason it seemed, and sometimes this showed. She possessed a strong faith in God that began simply in childhood, was severely tested by doubt in university, then deepened through the myriad experiences of her life. In her twenties, she was admitted to medical school but had to withdraw from her studies after a couple of years for health reasons. She became a nurse, and then nursing instructor, instead. She cowed more than one young nursing candidate as dean at St. Boniface School of Nursing but was also, I’ve heard anecdotally, considered “our best teacher” by others. She sought adventure and service by working also in Australia and in Pakistan. She taught us important things. When Wilma and her husband Dan were leaving for overseas work with Mennonite Central Committee in Africa, for example, she said, “You may think that you’re going overseas to do God’s work but don’t forget that you are God’s work, and God will want to change you.” This was advice Dan and Wilma often passed on when they were country directors in another MCC assignment. I liked my aunt a lot — her complexity, her mind, her heart, her opinions. Maybe I saw something of myself in her complicated temperament. I also saw, as Wilma did, the direction in which it was bent. And here’s the interesting thing. In the years leading up her final three years of major memory loss and inability to articulate her thoughts, she kept saying that she was determined to be content and uncomplaining. She worked on this, day by day, through the move from her house by the river to an apartment to a bachelor suite in a seniors’ residence to a single room in a personal care home. And when she lost mobility and so much of her mind, she remained content and uncomplaining. 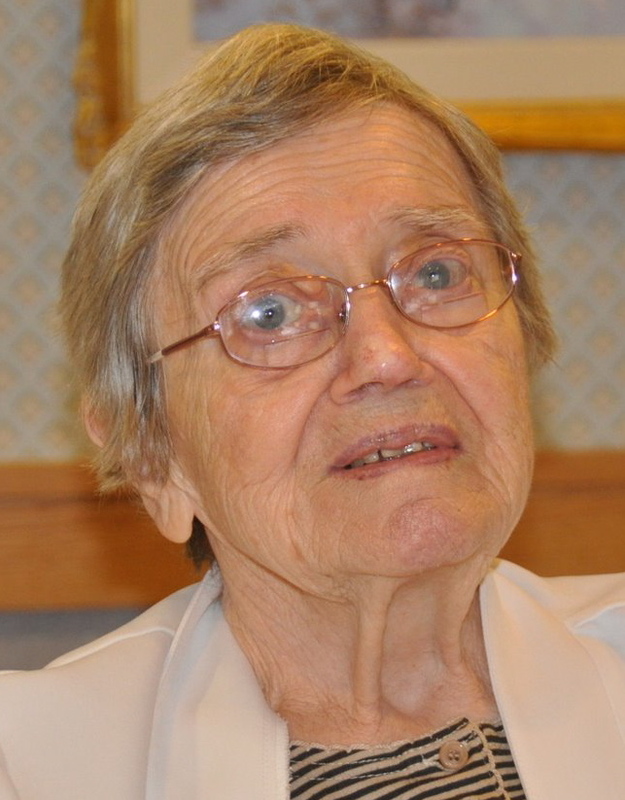 Staff praised her as one of their most cooperative and cheerful residents. Since I’ve seen alzheimer’s disease and dementia turn the personalities of some of our family’s mildest and kindest people into their polar opposites, this puzzles me a little. Was she, by choosing so firmly, able to set the course of those last years? I don’t know how the diseases of aging played out in her case, but it does seem a kind of grace — one of those ironies we are occasionally honored with perhaps — that she should be granted the wish she worked so hard to make true. June 27 note. I’ve added the following photograph, because of Al Doerksen’s comment to this post. It’s the photo to which he refers, taken by our father. 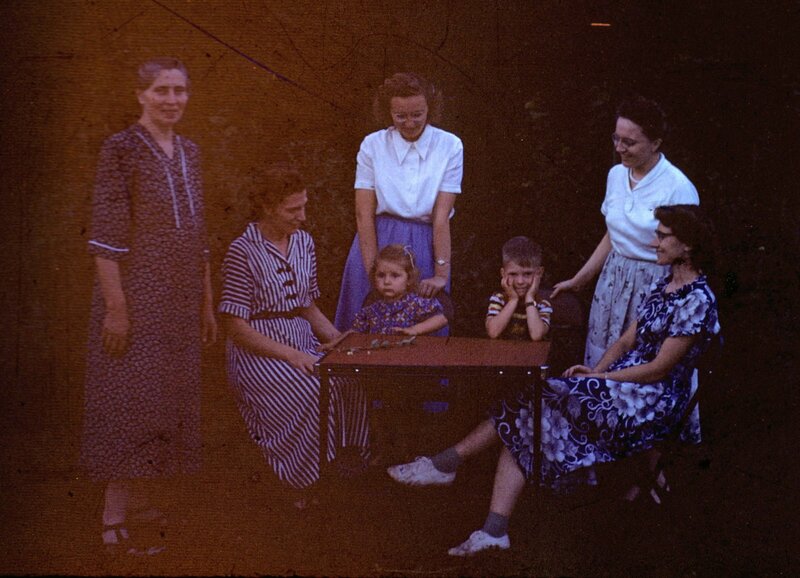 Gertrude Harder Klassen, second from right, enjoying the visit of niece Dora and nephew Alvin at the Harder farm, 1952. Others, from left, Helena Harder, Tina Doerksen, Margaret Harder. Susie Harder Loewen, right. This entry was posted in Family, Personal, Women's lives and tagged Gertrude Harder Klassen, Wilma Wiens by doradueck. Bookmark the permalink. I enjoyed this vivid character sketch and felt encouraged by the possibility that it might be possible to influence my attitude in old age. Few people actually want to become belligerent whiners, but some previously tender souls do so. A strong personality and a belief in prayer combined well in your aunt’s final days. May it be so for more of us! I agree! A former chaplain in a seniors’ home told me he often witnessed growth, change, transformation among his people; the elderly are not as static as we sometimes imagine. I too find that encouraging. Yes, she wasn’t always nice. Or so it seemed. We are at the Winkler farm. John Derksen and his family were visiting from the Congo. Cousins. I was a young boy. They were packing up to leave, and I was asked to take some bottles to the garbage. I took a short cut, and threw them into the bush behind the barn. A.Gert figured out that I had done this, confronted me, and sent me to retrieve the bottles during which time John & his family left. I didn’t feel it was fair. In going thru my archive collection of A.Gert photos, I came across a family photo from 1952 where she was standing behind me with a warm & friendly demeanor; she obviously seemed to be enjoying her nephew and niece Dora (also in the photo). The photo caused a bit of a revisionist activity in my memories of A.Gert as a young nephew. Of course, as a university student, I very much enjoyed sparring with her. Her intellect was keen, and her views were not concealed. She was in Pakistan while we were in India, and we exchanged some correspondence, prompted in part by VS Naipauls “Among the Believers”, ie, Islamic believers. Thanks Al, for the memories and reflections. BTW, I’ve added the photo you mention to the end of the post. It intrigues me how all who’ve spoken of Aunt Gert, since her passing, have such similar memories of who she was. This speaks well of her authenticity. Perhaps what solidified my deep love for and connection to this woman once and for all was the year she cared for our son Josh, whom she affectionately called “Schnigelfritz.” We lived upstairs in her duplex and she lived on the main floor. While I went to class at U of M Aunt Gert looked after Josh. Josh was in his first year of life. Upon my return there were usually pots and pans, tupperware, measuring cups, wooden spoons and an assortment of other household items scattered throughout her place with cupboard doors standing wide open. These were the places and toys Aunt Gert gladly let Josh explore and play with – “and why not?” – was her take on it. Why not, indeed! Thank you Aunt Gert. Another great story, Wilma! I can just hear her saying, “And why not?” –There is so much to remember and learn from the women (and men) who have been part of our lives. Wonderful reflections of your aunt, and I love the photo! !